Peach Rum Festival is the latest blooming cultivar we have ever encountered. Some years it does not start blooming until the end of August. September bloom will last 36-40 hours with the cooler temperatures, rebloom is prolific in October and even November until sub-freezing temperatures kill off remaining buds. A pale peach self, PRF is gloriously diamond dusted, fragrant from several feet away. Often the midribs of the petloids in the 3rd and 4th rosettes are raised into folded crests. 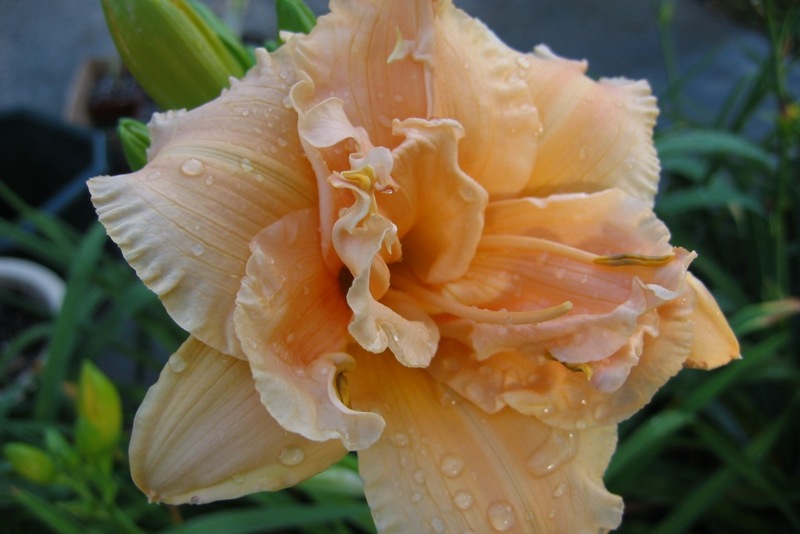 This is an incredible daylily with 5 way branching and budcount of 28. The only little fault we have noticed with PRF is that it does not like being crowded.